Replaces the PIN with high-performance biometric identifier. Eliminates data and PIN sharing with 3rd parties. Generate keys and certificates onsite, at user enrolment. Takes the Card Co away from the centre of the process and allows cards to be procured from multiple vendors. Build on standard authentication platforms and protocols such as PKCS#11. 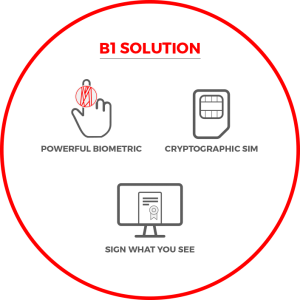 By combining three established technologies of Hitachi Biometric, Cryptographic SIM and Sign What you See the B1 device eradicates the need for a PIN, seen as the weakest point associated with any security device or solution. PINs are frequently lost, forgotten, shared or compromised and can be exposed to PIN trojans (PIN replay) on the web and this creates exposure for clients using these devices to protect their transactions. In essence, in the Finger Vein solution, the biometric data becomes the PIN. By combining this with PKI it strengthens PKI authentication and nonrepudiation as for the first time a transaction can be associated with an individual rather than at company level, providing clarity around who actually carried out the transaction. True Identity Assurance – including non-repudiation of transactions. In high-volume transaction environments provides a smooth ‘frictionless’ login and authorisation of payments with no PIN/OTP to enter.